Gaining international experience is crucial as it helps students become more adaptable to different learning environments, and gives them a foundation for their future careers. 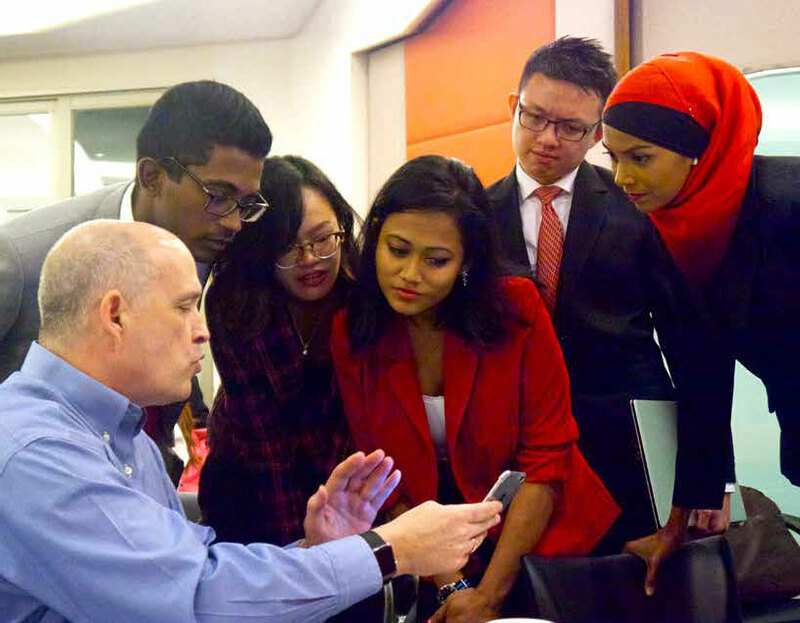 Working on a transnational project for global technology giant, IBM, enabled INTI students to learn the varying opinions and perceptions of their international peers, and empowered them to develop creative solutions to the business issues shared by their employer. Aimed at empowering students through international collaborations, INTI engaged with global tech giant, IBM, to develop a transnational employer project, which enabled INTI students from the University of Wollongong programme to collaborate with their Australian counterparts. INTI’s collaboration with established universities throughout the world provides students with the opportunity to visit, converse and learn from international lecturers and peers, and gain deeper insights into working with people of diverse cultures and backgrounds. INTI’s Career Services Office, an in house team dedicated to working with close to 400 industry partners in helping students gain practical work-related experiences, sourced for a good case study related to ITIL. Working together with IBM, 20 INTI students from the Bachelor of Information Technology (e-Business/Network Design & Management) programme were given the chance set about to analyse the case study on “ITIL: Incident, Problem and Change Management”,which kicked off as early as the first week of their semester. Students were given a full introduction to the project and attended a prep session which emphasized IBM’s expectations and the key dates and deliverables for the project. Under the guidance of a project manager and also an IT architect and consultant at IBM, the students were guided through the project and were able to share their concerns. Apart from the major project, the students were also required to undertake a smaller assignment before diving into the main aspects, which help them to prepare for the tasks ahead. The additional assignment ensured they were clear on what is needed to be accomplished and the expectations they needed to meet in working with the global conglomerate. 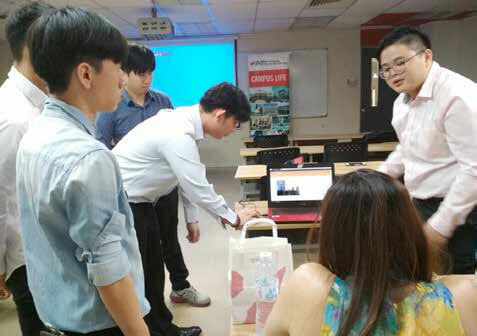 To facilitate the cross-border communications required for the project, students were taught to utilize a common learning platform, Moodle, which included easy-to-use discussion forums. This learning platform was also used on a regular basis as the official collaboration tool between the IBM team and the students. Leveraging INTI’s video-conferencing facilities on campus, the students were able to engage easily with their employer, and to seamlessly exchange information that was in an engaging and dynamic manner. The use of technology to support the overall three-way communications between both institutions and IMB created a conducive environment for the students’ learning process. To ensure that every student contributed equally to the overall success of the industrial project, a peer assessment was carried out. Each student assessed their peers on aspects such as listening skills, leadership skills, cooperative skills, online support and time management skills. The outcome resulted in both sets of student teams sharing the same goals to excel in the project and deliver the best outcomes possible. Towards the end of the project, the students presented their findings to IBM and their respective lecturers. Although the project only spanned 18 weeks, the students provided positive feedback, many of whom shared that the entire task helped them tremendously in developing important life skills. It was an effective method to increase students’ learning and introduce them to the real world, enabling them to build a solid foundation for the the rest of their programme and gain a better understanding of the industry. 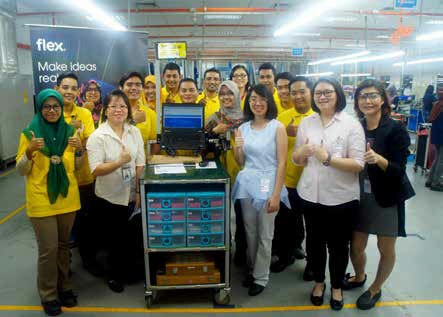 Eight INTI students from the 3+0 Bachelor of Science (Hons) in Computer Science in collaboration with Coventry University, UK programme (BCSCU), had the pleasure of collaborating with Flex Penang. The company is the Sketch-to-Scale® solutions provider that designs and builds Intelligent Products for a Connected World™. In the manufacturing sector, the ‘Quality Data Transfer System’ (QDTS) is a web based system that is widely used at production floors. The system automates the QA inspection, and approval process. At the same time, it performs data analysis and presents the results in various charts for management review. In order to develop and control this situation, the system would need to work properly. In order to solve the task at hand smoothly, students applied what they have learned in class. Their skills in the areas of Computer Science and IT were performed during the project. The project was initiated in June 2016, whereby Flex approached INTI International College Penang for the Employer Project (EP) collaboration. There were three phases involved. Phase one was about business requirement gathering and prototype development, and testing. It involved three Diploma in Information and Communication Technology students, under the supervision of Ms Koo Lee Chun. The EP was completed by the end of November 2016, as phase one EP and the project was passed to Flex for review and observation. As for phase two, it started on August until November 2017. It was about the enhancement, development and deployment of the Data Transfer System to the production floors. In this phase, the project was developed by two students from BCSCU programme, and INTI International College Penang – Cheok Ju Kheng and Tan Shu Xuan. Since August 2018, the system is currently pilot run in the production. The enhancements were to include the defect disposition process, which is still in progress. We also appointed three Computer Science students to work on phase three of the project, from August to December 2018. The students will work on the EP as internship trainees within the Flex Company. We believe through these helpful trainings and exercises, students were able to experience working in real life projects as well as industries. They have also successfully put their knowledge into practical practices. RamRais is an established premier law firm in Malaysia. And they were looking for a way to revamp their legal firm website, to make it more interesting. So, a collaboration between them and eleven of INTI students from the Bachelor of Computer Science based in INTI International University was done to execute this exciting direction. RamRais wanted a whole new look and feel for their legal firm website. So, they wanted someone to come up with fresh and new design ideas that would make their website look more attractive and refreshing. The objective of this project was for students to study the current trends that were happening in the website world – in terms of designs and developments, specifically for the legal industry. They were also assigned to come up with a design recommendation for the employer’s consideration and adoption. In addition, they needed to use WordPress or any website platform that is easy to use when editing and changing the website. During the project, students applied what they have learned in class to execute their task. They used Software Quality Standards (SQA) and Software Quality Assurance (SQA). The students presented a successfully revamped website design and development and even had the opportunity to work with prototypes of RamRais website. Throughout the project, students learned how to work collaboratively and evaluate the quality standards of software. They were also able to demonstrate and apply critical as well as analytical thinking skills. Furthermore, they managed to propose relevant features and functionalities that are suitable for the intended stakeholders of the proposed system. All in all, the presentation was a success as they were able to please audiences of RamRais with the revamped website.